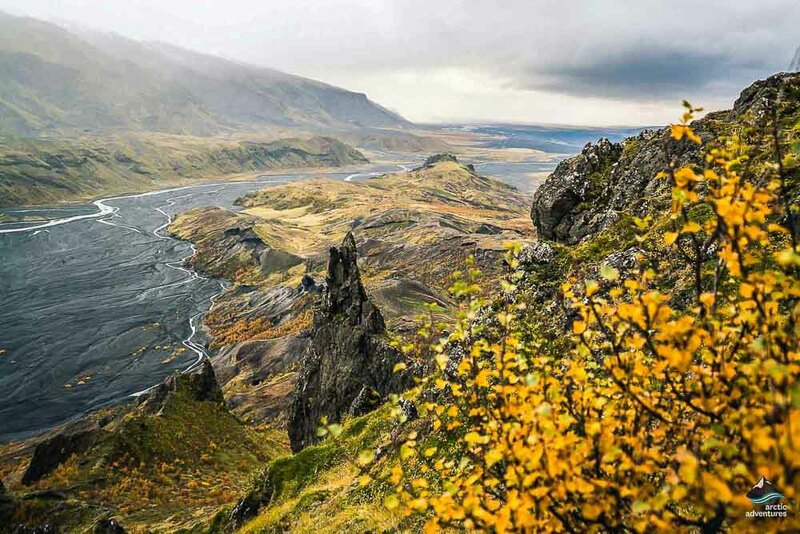 Each year, thousands of visitors travel to Iceland to experience and enjoy the country’s exciting hiking routes, some of which deservedly appear on lists of the best hikes in the world. Gifted with an extremely varied landscape and awe-inspiring natural wonders, Iceland is one of the best places in the world for hikers and explorers. Each region of this country offers visitors something different and unique. There are some amazing hiking spots surprisingly close to the capital. Many hiking trails are easily accessible from the main road. There are beautiful trekking routes off the beaten path as well, far away from the populated areas. Whether you fancy climbing ice walls and glaciers, reaching the summits of tall mountain tops and volcanoes, exploring thrilling waterfalls and hot springs, or backpacking across Iceland’s national parks, there is a multitude of options available for every kind of adventurer. Aside from giving you a lot of alternatives when it comes to sightseeing, the variety of trails to choose from will provide an amazing hiking adventure no matter what your fitness level may be. 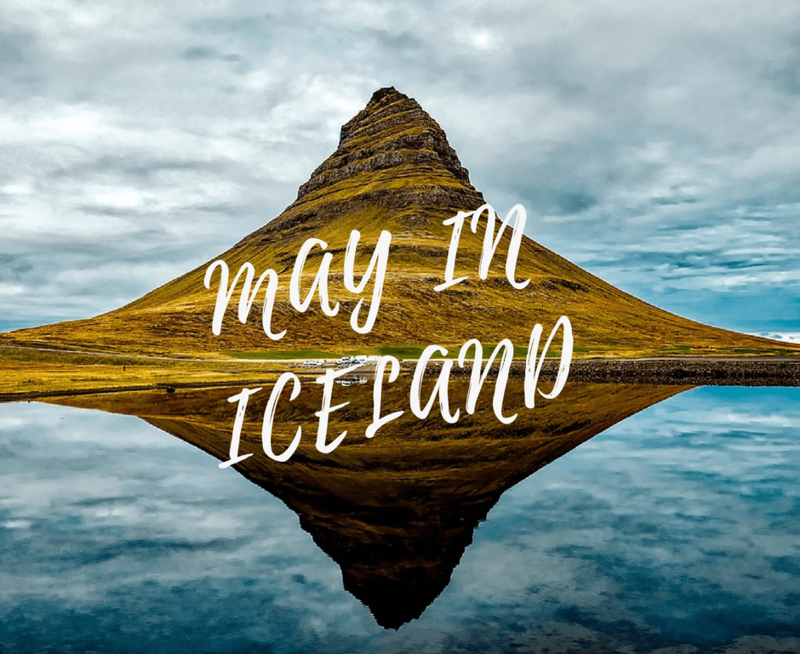 Whether you are an experienced hiker or just starting out, you will surely find a suitable adventure in the following list of the best hikes in Iceland that we have put together for you. Enjoy your walk! When Is the Best Time to Hike in Iceland? Probably one of the most common questions when it comes to hiking in Iceland is, when is the best time to do it? Ultimately, the summer months – June, July, and August – are the best for hiking in Iceland. These are the warmest, the driest, and the least stormy months, making summer the safest and the most comfortable time for hiking. The temperatures range between 10-20°C (50-68°F) and the average wind speed, precipitation, and storm frequency are lower than at any other time of the year. The landscape blooms in its full glory. Sheep freely wander through the green pastures, vivid Arctic flowers grow everywhere, mosses and birch forests thrive, and loud bird chatter fills the air with life. Locals and foreign visitors spread out to the greenery to explore Iceland’s hidden beauties and to enjoy the gifts of the summer and the midnight sun. Real adventurers will leave the beaten path and wander into the Highlands to follow Iceland’s best hiking and trekking routes. These trails are open only for a limited period of time during the short summer months. 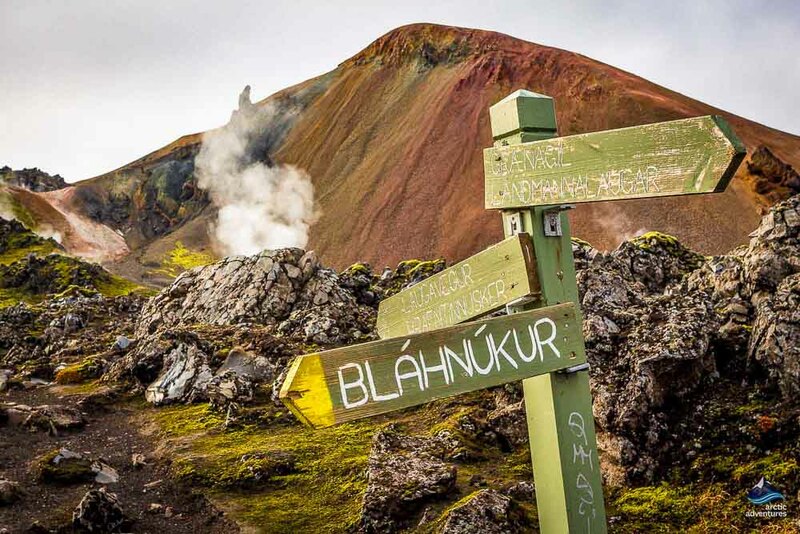 The Icelandic Highlands are only accessible for hikers between mid-June and early September, while the world-famous Laugavegur Trail is best to complete from July to late August. The remote Hornstrandir Nature Reserve is also accessible from around mid-June to about August 20. These areas are the most pristine hiking sites in Iceland. The edges of the season, from May to mid-June and from late August to mid-October, are quite unpredictable. The temperatures are usually a few degrees lower than in summer and the weather is much more erratic. Both spring and autumn can be very rainy and windy or beautifully sunny and calm, but no one really can know this in advance. Every year is different. The landscape is usually golden brown all over the country, if not white. In May and June, there is no darkness at night. In May, the endless sunsets and sunrises start to kick in. In September, however, the nights are dark and the Northern Lights may appear in the sky. The accessibility of the trails depends highly on the actual weather conditions, on the area, and on the type of terrain, you would like to hike. If the winter was bad, then May is not a good option for hiking as there can be still plenty of snow, especially at higher altitudes. Even if the weather is excellent all around the country, the Highlands are still inaccessible in May due to bad road conditions and snow. 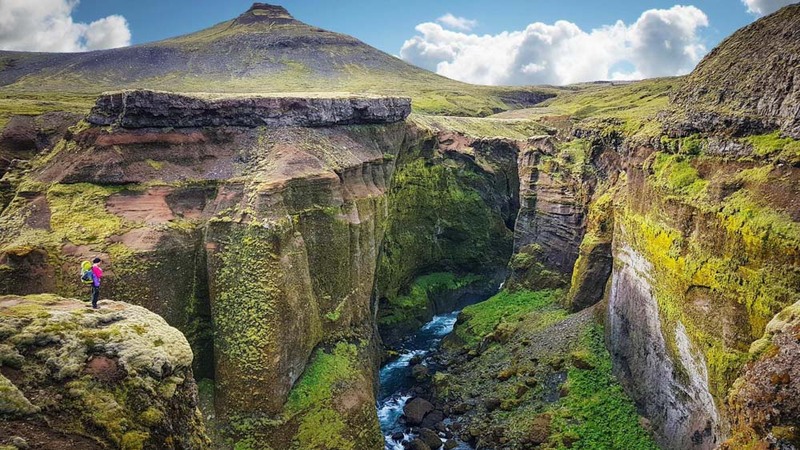 Some shorter and less remote trails, however, such as the Reykjadalur Hot Spring Hike, the Glymur Waterfall Hike, or the Thorsmörk Volcano Hike, can be completed in spring and autumn as well. September is usually rainy and stormy but it can sometimes be nice and sunny, too. October is considered the beginning of the winter; this is the time the first snow falls in the lower altitudes while the Highlands will already be covered by thick snow. Iceland, of course, is famed for its long winters. The winter season, however, can be one of the best times to visit. The country is at its best when twinkling in the snow and shining under the Northern Lights. And, despite what you may think, Iceland is not that cold in the winter, with the city of Reykjavík experiencing an average temperature of 0°C (32°F) during winter. The average temperature in the mountains is much lower, of course. Winter is not the best time for longer hikes. The daylight lasts only 3-6 hours and most of the hiking trails are not accessible at all. 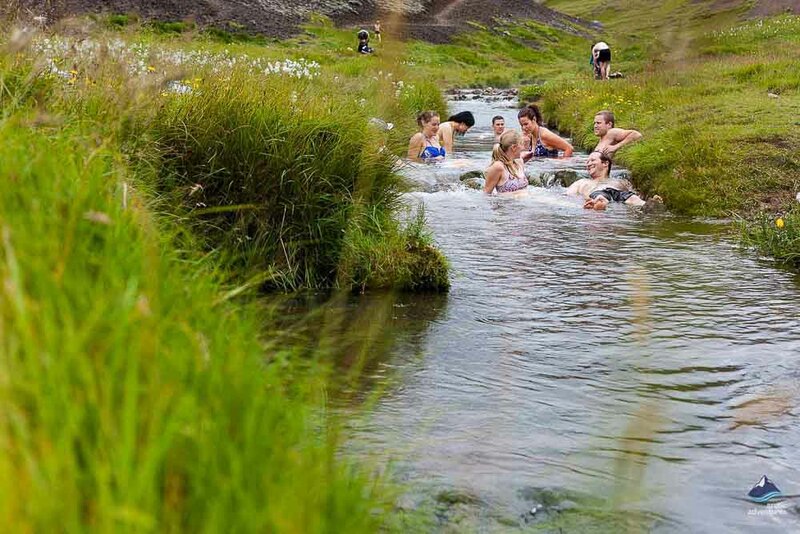 However, some low-altitude hikes, such as the famous Reykjadalur Hot Spring Hike, are walkable all year round. Even hiking these shorter tails requires good preparation. It is necessary to research the weather, the trail conditions, and the possibility of avalanches before heading out. Hiking spikes or crampons are a must. For the best experience and safety, join a guided hiking tour. Once you have packed the right equipment, enough layers, and provisions, hiking in winter in Iceland is a thoroughly enjoyable experience. The vast 40,000-square-kilometer deserted wilderness in the country’s interior is called the Icelandic Highlands. This area contains some of the most extraordinary landscapes in Iceland and is home to some of the best hikes in the world. For those looking for something truly unforgettable, choosing any of the trails in this area is a complete no-brainer. 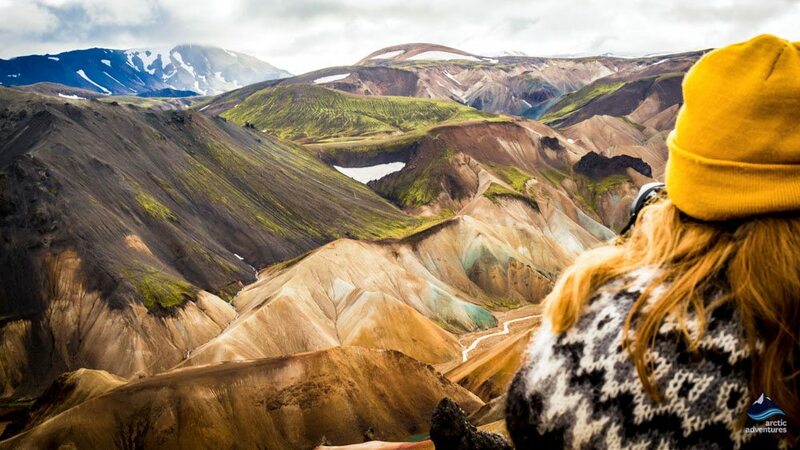 The country’s premier hiking destination, Landmannalaugar, is located in the Southern Highlands. This site is famous for its incredibly colorful landscapes, thanks to the multi-colored rhyolite mountains, moss-covered slopes, and geothermal valleys. The name directly translates to the “Pools of the People” and was originally used by settlers as a bathing area. Known for its mind-blowing natural hot pool and exciting mountainous terrain, Landmannalaugar is a haven for hikers who enjoy ever-changing scenery and unique geographical features. The Arctic Adventures’ designated Landmannalaugar Day Hike takes you through the Laugahraun lava field up to Mt. Brennisteinsalda, a multi-colored peak and the most characteristic mountain in the region. Hikers will also walk down the surreal Graenagil Gorge made of unbelievably green rocks. If time allows, we may climb up to the summit of the impressive Blahnukur, a mountain made of blue and green rocks, before taking a relaxing bath in the hot pool. For those who want to make the most of their visit to the area, we highly recommend spending a few days in Landmannalaugar. Hike past stunning Lake Frostastaðavatn and visit Ljótipollur, an impressive red volcanic crater filled with cyan blue water. 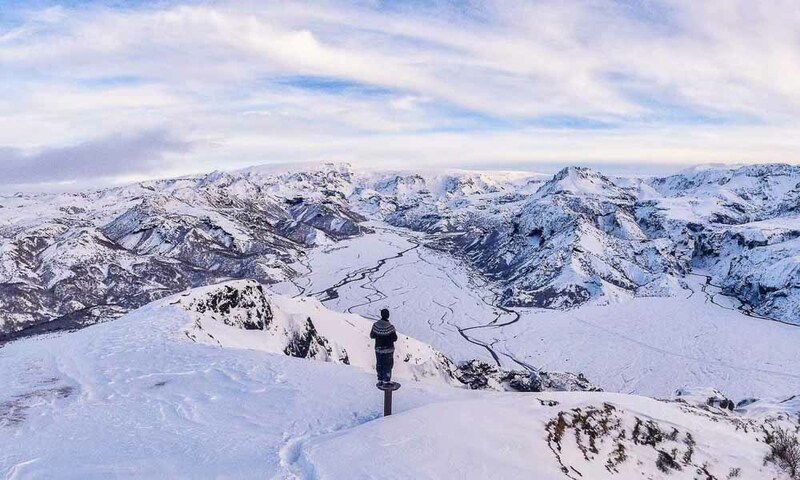 Climb the volcanoes of Brennisteinsalda and Blahnukur before reaching the summit of Suðuhámur, another colorful rhyolite mountain. Wander across Vondugil Canyon, hike through the Laugahraun lava field, and bathe in a hot spring while this extraordinary place enchants you. Landmannalaugar is also the base for the famously beautiful Laugavegur Trek, which has been listed as one of the world’s best hiking trails by the National Geographic. The Laugavegur Trail leads 34.1 mi. (55 km) south through some of the most exquisite parts of the Icelandic wilderness. Hikers will walk among the rainbow-colored mountains of the pristine Fjallabak Nature Reserve. They will also cross steaming ground, hot springs, sparkling obsidian fields, black deserts, oddly-shaped mountains, deep canyons, and unbridged rivers. The 4-day Laugavegur hike ends in the lush birch forest of a fertile valley, framed by three glaciers and the moss-covered ridges if the surrounding mountains. This vibrantly green valley, called Þórsmörk or Thorsmork, is one of the locals’ favorite areas for hiking and camping. The Laugavegur Trail is accessible from late June to early September every year. There are four huts along the way, spaced a few hour’s hike apart. Out of season, the huts are closed and it’s not possible to hike in the area. If you’re looking to explore the vastness and diversity of Icelandic nature, this trek should be at the top of your bucket list! Situated in Iceland’s Southern Highlands, Thorsmörk Valley is nestled between three glaciers: Tindfjallajökull, Mýrdalsjokull, and the world famous volcano-glacier, Eyjafjallajökull. Named after the Norse god Thor, the valley boasts a multitude of hiking options. The area offers breathtaking views of jagged, mossy slopes and of tapered valleys with sparkling glacier rivers sneaking through them. Thorsmörk is filled with rich birch forests and has a special microclimate which is somewhat warmer than the surrounding areas. There is an amazing network of hiking trails in the area which provides fabulous hikes at a variety of lengths and levels of difficulty. Our Thorsmörk Volcano Hike takes in the best scenery the region has to offer. Along the planned route, hikers will climb steep hills and traverse deserted plateaus before climbing up to the freshly formed volcanic craters Magni and Modi, which were named after the children of Thor. These craters were formed in 2010 during the notorious Eyjafjallajökull eruption. The view from here may be the most beautiful you can find in the entire country! In good weather, you can see up to 100 kilometers (62 miles), all the way into the very heart of the Icelandic Highlands! The trail leads up to the Fimmvörduháls eruption pass and then before descends back into the vibrant valley of Thorsmörk. After the long hike, on the way back to the city, hikers will get the chance to visit majestic Seljalandsfoss, the 60-meter (196 foot) tall waterfall that you can walk behind. The tour lasts between 12-14 hours, together with transportation. There is also the option of extending the tour over two days and hiking the entire Fimmvörðuháls Trail. 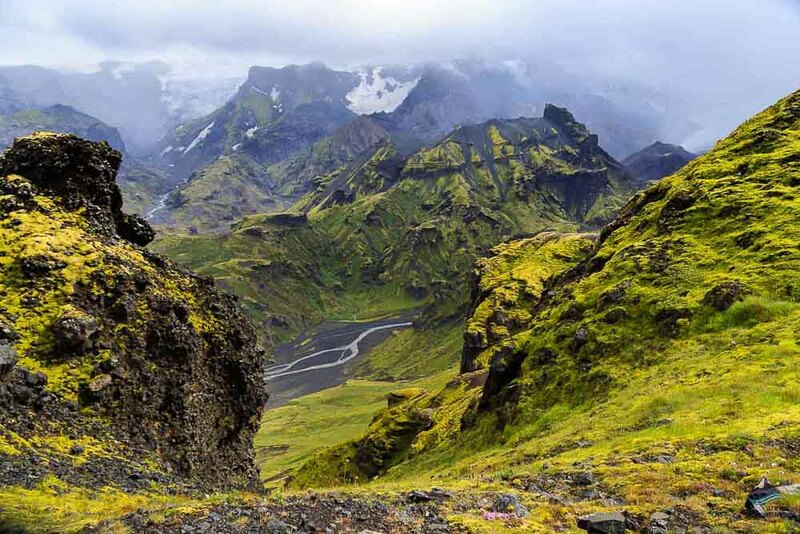 The 25-kilometer (15.5 miles) long Fimmvörðuháls Trail is Iceland’s second most popular hike. It can be started either in Skógar, from the top of the 60-meter (196 foot) high Skógafoss Waterfall, or in Thorsmörk and ending at Skógafoss. Most hikers complete this trek in two days, spending the night in the mountain hut on the trail. If started at Skógafoss, the path leads along the Skógá River with an uncountable number of waterfalls lining the path along the way. Thanks to their fortunate location, two of Iceland’s most famous treks can be combined into one adventure. The ultimate Laugavegur-Fimmvörðuháls Trek starts with the Laugavegur Trail in Landmannalaugar. The path then leads to the Fimmvörðuháls Trail in Thorsmörk, crossing the Icelandic Highlands in a combined trek that is 77 kilometers (47.8 miles) long. The Westfjords are arguably Iceland’s most remarkable region. 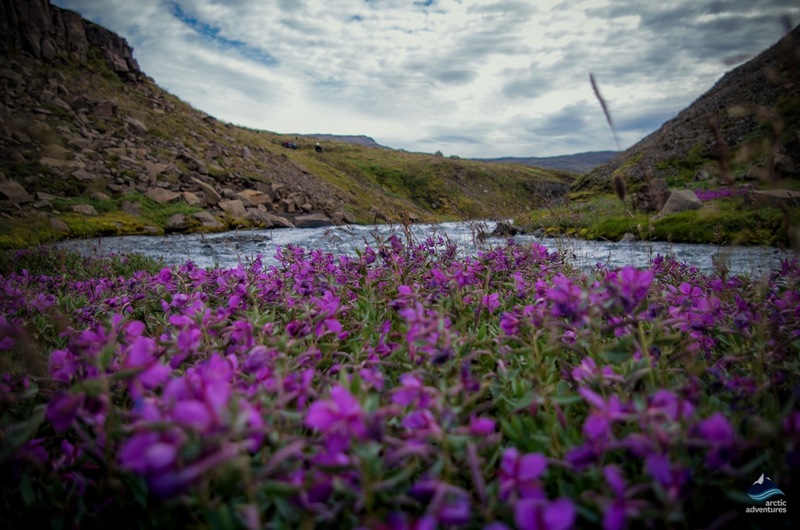 Full of mystery and natural beauty, the Westfjords are begging to be explored and should be at the top of the bucket list when it comes to hikes. Being the least traveled part of the country, the area offers visitors authentic off-the-beaten road adventures with plenty of amazing hiking opportunities. 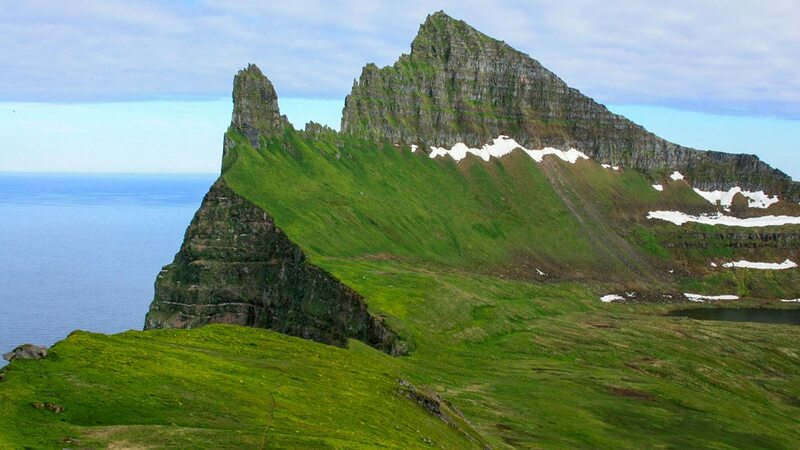 The outstanding Hornstrandir Nature Reserve is Iceland’s most remote hiking area, located in the Westfjords. This site is one of Europe’s last undisturbed wilderness areas, covering 580 square kilometers (220 square miles). Hornstrandir is so remote and isolated that it is only accessible by boat. There are no roads, no infrastructure, no services, and no cell phone reception. The region is only accessible during the mid-summer period, making hiking only possible from late June to mid-August. Even in those months, the nature reserve is by far the least frequented hiking area in Iceland. One can trek for days in Hornstrandir on end without seeing a single person! The nature reserve is home for some of Europe’s largest and most thrilling bird cliffs. The natural scenery is simply breathtaking and what makes this area even more special are the Arctic foxes. They are protected and abundant here and therefore they are not shy at all. Sometimes they approach the hikers at a very close range and they are very curious. Iceland’s only native mammal may be one of the cutest animals on the planet! Hornstrandir is accessible from Ísafjörður by boat. There are no huts in the nature reserve, so multi-day hikers must sleep in tents. Anyone who travels here must be completely self-reliant and fully prepared with enough food, water, high-quality clothing, and camping equipment. For your maximum safety and comfort, we recommend joining a guided hiking tour where an experienced local guide will lead you through the most beautiful hiking site on the remote peninsula. 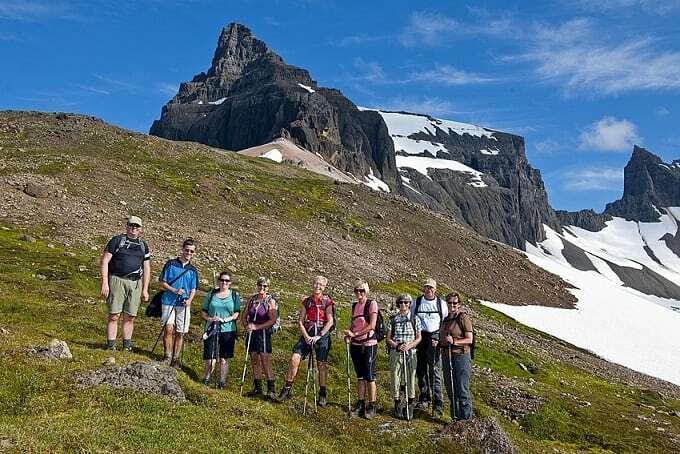 Guided day hikes and multi-day treks depart from Isafjordur during the summer, from mid-June to late August. Famously used as the setting for Jules Verne’s epic science fiction novel Journey to the Center of the Earth, the mystical Snæfellsjökull glacier-volcano is one of the most popular tourist attractions in Iceland. 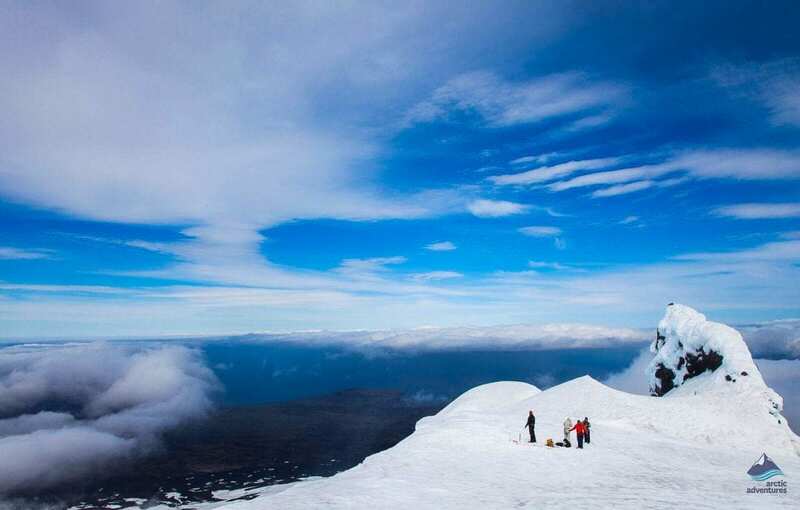 Hikers who want an icy challenge love the Snæfellsjökull summit hike! It is, indeed one of the best day treks you can do in Iceland. 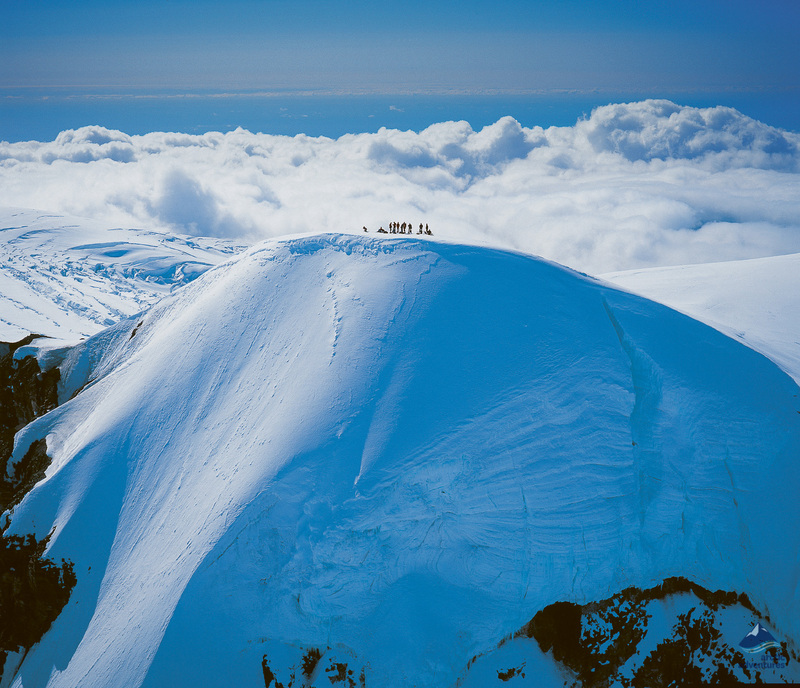 After arriving at the base camp, you will hike over lava and volcanic rocks before tackling the glacier itself. As you climb higher and higher, snow and ice will become more dominant, which is why you will need crampons to complete the climb. From the top, the view is absolutely breathtaking. In good weather, you can see all of the Snæfellsnes Peninsula from above as well as across the enormous Faxaflói Bay. You may see all the way to Reykjavík! The summit of the glacier reaches a height of 1,446 meters (4,744 feet), with the full hike only being 7-8 kilometers (4.3-5 miles) long. It is a challenging hike, ranging from about 6 to 9 out of 10 in difficulty, depending on the season and the weather conditions. 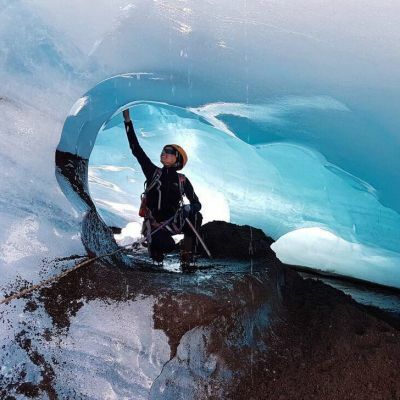 Climbing up to a glacier requires professional guidance and equipment, so make sure you join a safe guided tour instead of trying alone. If you are planning on a hiking holiday in Iceland, you will be glad to know that there are plenty of hikes near Reykjavík. 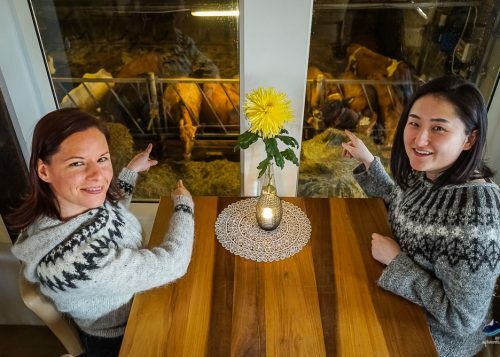 This is ideal for outdoor enthusiasts who only have a short time in the country or who want to see more of Reykjavík’s surrounding countryside. The Glymur Waterfall Hike takes you to the second-highest waterfall in Iceland at a height of 119 meters (390 feet). It is located at the end of Hvalfjörður, the whale fjord, just about an hour’s drive from Reykjavík. The path takes you through a picturesque cave, follows a steep gorge, and is beautifully exposed with thrilling viewpoints of the breathtaking canyon and waterfall. At the beginning and in the middle of the hike, there are two rivers that must be crossed on foot. This definitely makes it one of the most adventurous hiking trails you can find in the vicinity of Reykjavík. You will not be disappointed, for sure! The geothermal valley of Reykjadalur, only a 40-minute drive from the capital, is a region of tranquil natural beauty and exciting geothermal activity. Hikers can explore the “steam valley” at their own pace and witness the hot water flow down the slopes of the Hengill volcanic mountain range. In a valley between the mountains in the middle of nowhere, there is a steaming warm river where the water temperature is ideal to enjoy a relaxing bath in. There is plenty of space so even if the place is quite popular, it is still worth a visit! Hiking in Reykjadalur is a great day trip for anyone, whether you are a true hiker or just keen on escaping the hustle and bustle of city life. Have we included your favorite Icelandic hike in our list? If not, be sure to tell us what yours is in the comments section!